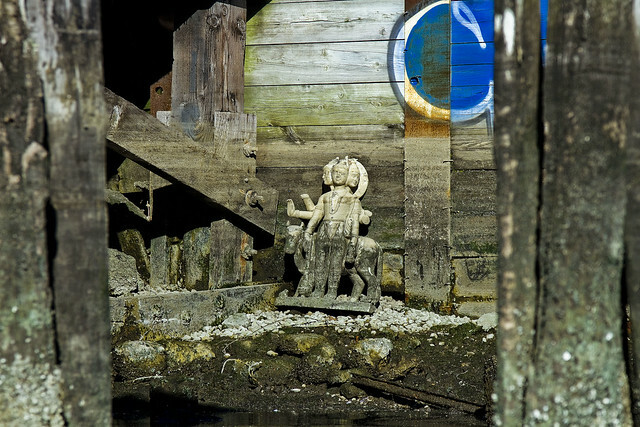 An altar to Lord Dattatreya, at Newtown Creek. Last Sunday, which was the only day in Decemeber that has actually felt – climatologically – like December, one found himself in the company of a couple of my Creek chums in a small boat on Newtown Creek. We saw something odd while out on the poison waters. 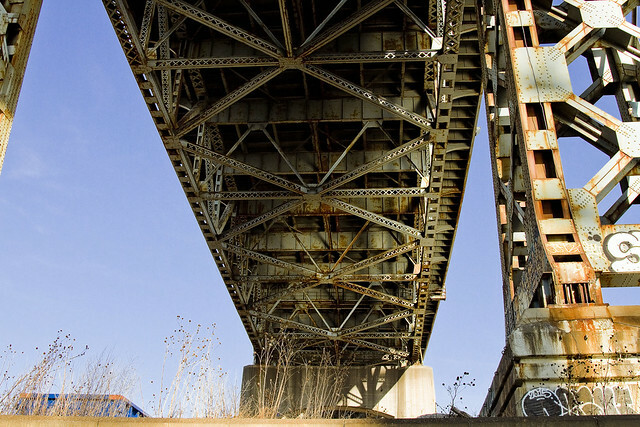 Our excursion was launched in pursuance of surveying certain bulkheads in an area defined by the former Penny Bridge and the Maspeth Avenue Plank Road. We were literally studying the Creek, and I was along to gather photographs for further inspection at a later date – this is the sort of sinister stuff we get up, in Newtown Creek Alliance. 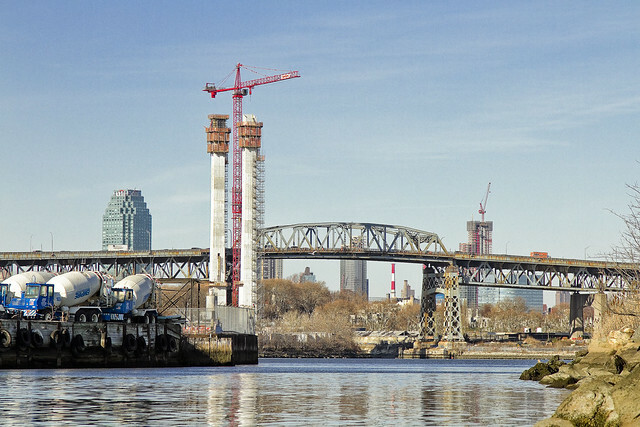 Our survey of the study area was completed, a loop through the East Branch tributary was enacted, and we were headed west towards a dock at North Brooklyn Boat Club nearby the Pulaski Bridge in Greenpoint. The Restaurant Depot company, a wholesaler which supplies commercial food establishments, sits on part of the former Phelps Dodge property in Maspeth. Their property is lined with industrial piers which have seen better days, but which were stoutly constructed and you can still observe rail tracks adorning them. 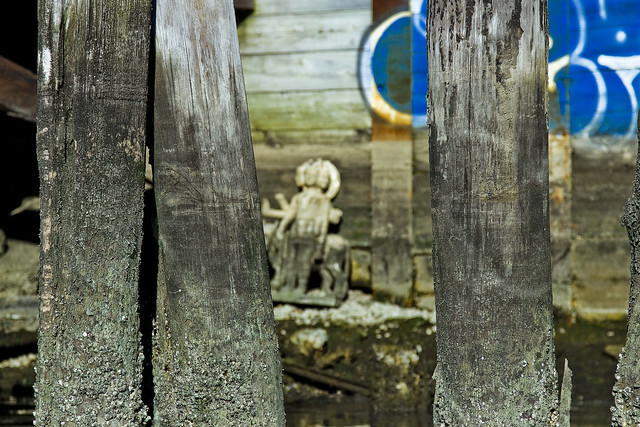 In a couple of spots, the piers have decayed or collapsed, and there are little wooden bays amongst the piles. That’s where the statue is. The style of the thing is clearly southeast Asian, and specifically subcontinental. Given the reach and spread of Indian culture, which is far flung, it’s often difficult to say “Indian” as opposed to “South East Asian.” The statue, however, displayed certain details which betrayed its stylistic and ritual origins, and after a bit of research – the specifics of its representation. How it ended up in the littoral zone at the former Phelps Dodge property on Newtown Creek in Maspeth is anyone’s guess. I’ve long stopped asking these sort of questions on the Creek. The statuary was around three to four feet in height, and seemed to be made from molded concrete. It depicts Lord Dattatreya, who is a well known member of the Hindu Pantheon. 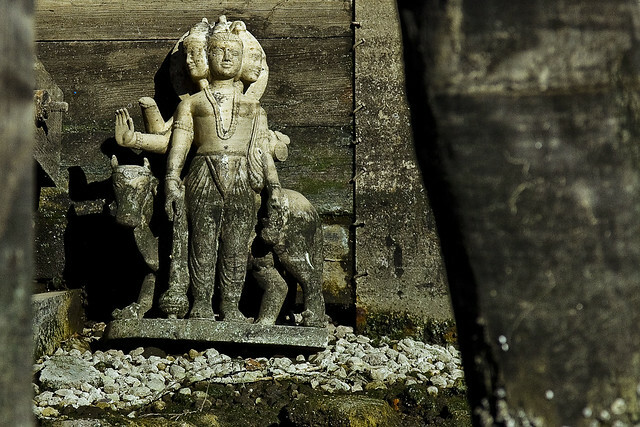 The particulars of the statue are that it represents the Hindu trinity of Vishnu, Brahma, and Shiva – which members of the faith refer to as the Trimurti. Dattatreya is a primordial figure in Indian culture, and is mentioned in the Mahabharata – an epic holy text whose origins are nearly prehistoric. Mahabharata scholars believe its texts were originally written between 800 and one thousand BCE, making it a 2.5-3,000 year old holy book which is coincidentally the longest epic poem ever written at nearly two million words. Mahabharata is as culturally significant a text as the Christian Bible or the Quran, and offers spiritual guidance to what probably boils down to as much as a quarter of all living humans. Dattatreya veneration was ancient when the Mahabharata was written, and the deity was originally represented with one head. Dattatreya came from the Deccan Plains in South Eastern India, which is one of the cradles of human civilization. The Trimurti version of the deity, seen above, has six arms and three heads. That’s Brahma on the statue’s left, Vishnu in the center, and Shiva on the statue’s right. The hands are all meant to be holding symbolic weapons and icons of these deities. The cow is sacred to Vishnu, and although it’s not terribly clear in the representation above, there are traditionally four dogs on a Dattatreya statue. Hindu scholars debate the meaning of the dogs. When the Vedic religious traditions began, Dattatreya was reconsidered as an avatar of the Trimurti. About a thousand years ago, it became common practice to represent the deity as three headed. Certain Hindu sects revere Dattatreya as a supreme being singularly, with others placing him near the top of the food chain in the pantheon, but still subordinate to Vishnu, Shiva, and Brahma. His sister is Chandra, who is the moon goddess. 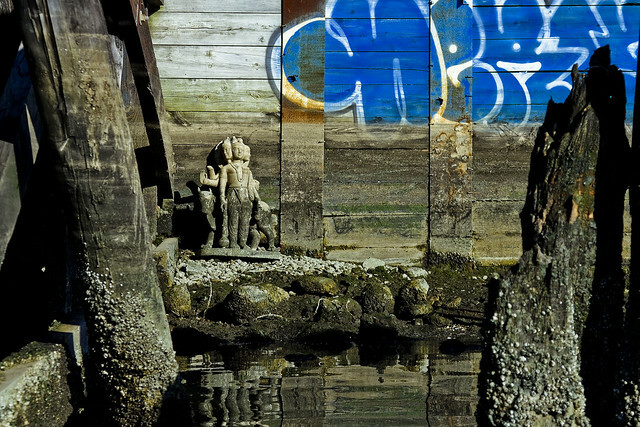 One can merely speculate as to the presence of the statue in the tidal zone of Newtown Creek, and as to what sort of congregants might rise from the water to worship before it. As mentioned above, our party was out on the water performing a bulkhead survey, and we were in search of something far more modern and mundane than an ancient Indian God. Controversy in the Superfund community has recently involved discussion of “Manufactured Gas” and the ebullition (reverse dripping) of coal tar sludge from subaqueous pockets in the sediment up to the surface. This has resulted in a humble narrator “getting smart” about the waste materials which the manufactured gas industry spewed out. Coal tar, and coal tar sludge, were – by far – the most abundant material that arose from the retorts and distillation equipment of the industry, but were hardly the only noxious material produced. We were searching for “blue billy” amongst the rip rap shorelines of the lugubrious Newtown Creek, which is “spent lime” that had become infiltrated by ferrocyanide compounds during the industrial gasification of coal. There was no aftermarket for this material, and more often than not it was just dumped. Examining photographs of “blue billy,” my cohorts in NCA and I all remarked on how familiar it seemed, and set out to find some. Instead, we found an Indian God. Hmmm…I would have expected this guy in the NC.